It was the 24th of November and Nina’s tiny fingers made quick work of the huge lumps of soil, disintegrating it into smaller lumps, which fell onto the vegetable plot below. She wasn’t alone. Something of a troop leader, the 20 other children of Villamaria, crowded around the new vegetable plot and followed suit. Their oohs and aahs over earthworms, and other creatures that inhabit the soil, and incessant chatter filled the air in a cacophony of delightful sounds - the atmosphere palpable with their excitement. Vegetable gardening hadn’t been more exciting. 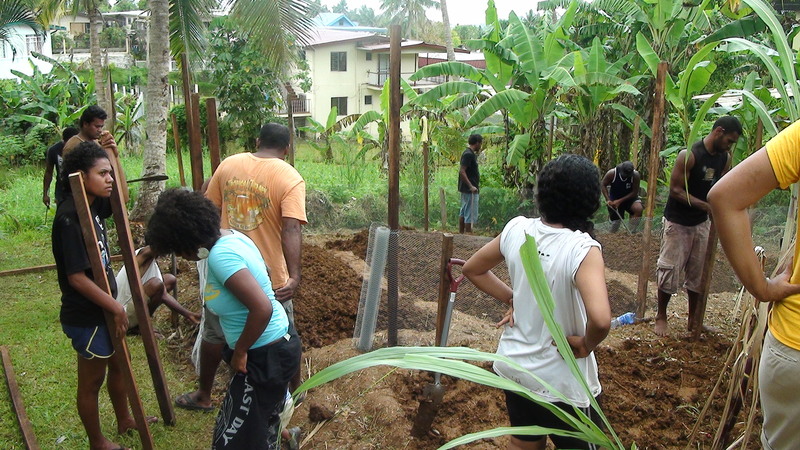 The vegetable garden is an initiative of the WWF South Pacific Volunteers vegetable garden, compost bin and PET bottle collection project at the settlement. The project embodies the principles of greening, sustainable land management and promotes alternative sources of income through gardening and recycling. Apart from rendering benefits that include food security and a possible income source for the community, involving the children with the mean age of 10 years, imbued in them an appreciation for backyard gardening and protection for the environment. 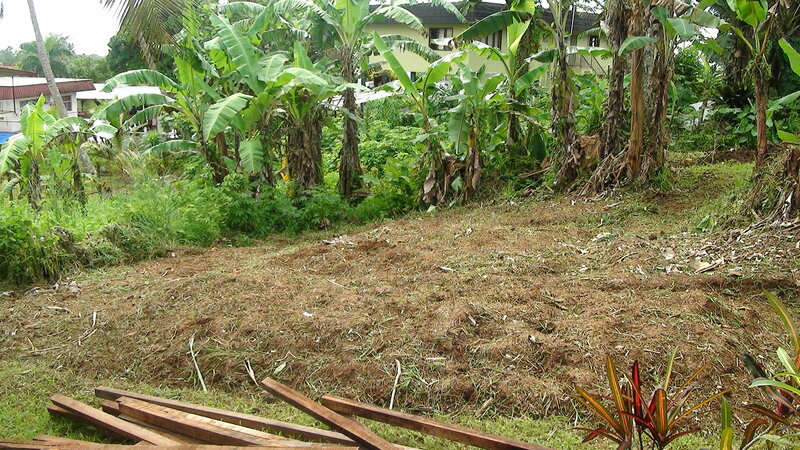 Villamaria, in case you didn’t know, is located along Mead Road, within the general Tamavua area of Suva. The 25 families that occupy the five acres terrain are descendents of Wallis and Futuna immigrants, who with their bare hands, built famous landmarks of the Catholic Church that includes the Sacred Heart Cathedral and the Home of Compassion more than a century ago. The land is a gift from the Catholic Church of Fiji. Eight year old Nina Lawrence Catherine Berwick who lives with her grandmother is wise beyond her years and understands only too well the importance of gardening. A natural leader, Nina led the children, some older, in lifting wooden planks that will held up fencing to protect the garden. 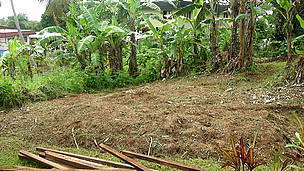 They crumbled the soil, ever so careful not to harm earthworms and soil organisms vital for the healthy growth of plants. 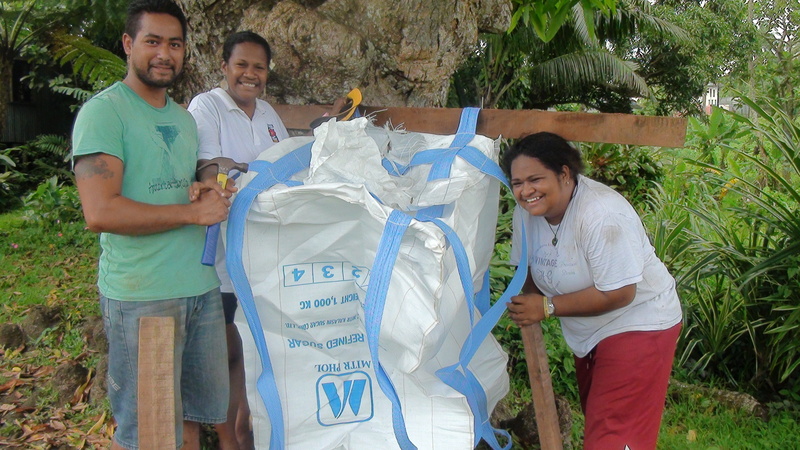 At the same time they fired a million questions at Unaisi Malani, WWF South Pacific’s Sustainable Landuse and Livelihoods Officer and their ‘Aunty Sia’. “Earthworms make the soil healthy by mixing it with minerals and aerating it,” Malani patiently explained for the umpteenth time. 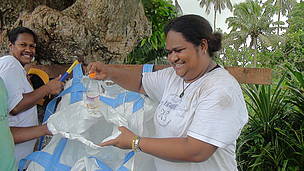 ‘Aunty Sia’ is Teresia Powell a volunteer for WWF South Pacific, who resides at Villamaria and the inspiration behind the setup of the garden and recycling project there. The projects are linked and self-sustainable. Income from the sales of PET bottles will be used to buy more seeds for the garden and the eyesore that is litter is resolved. 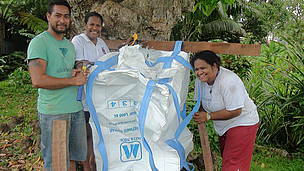 “With the help of recycling bags, it should revive some awareness of the dangers of improper disposal. This will also help the community members to take pride of their environment and educating sustainable livelihoods to their children,” Powell said. The Villamaria project also benefits WWF South Pacific volunteers and enriches the national workforce skills bank by educating young graduates and tertiary school students through experiential immersion. By the time the volunteer van pulled out of Villamaria, a vegetable garden, two compost bins and a PET bottle collection bin had been set-up. 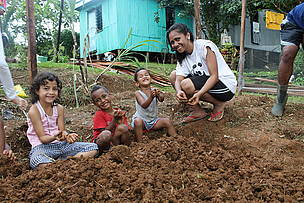 Hope has also been planted with the promise of alternative sources of income as the garden and recycling project grows. 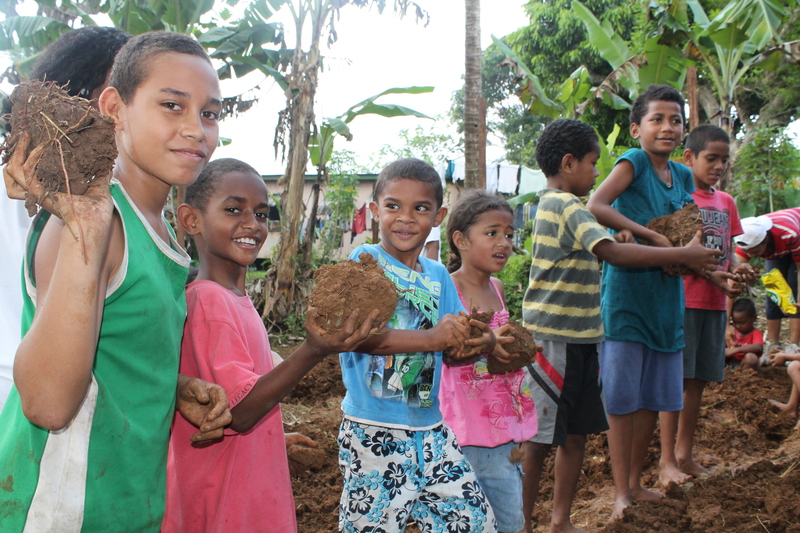 More than that, a fire for the protection of the environment had been lit in the hearts of Villamaria residents, especially in the little ones who will fan it into fiery actions for the environment, far into the future. Eight year old Nina Berwick with her friends at Villa Maria brought the community garden alive. 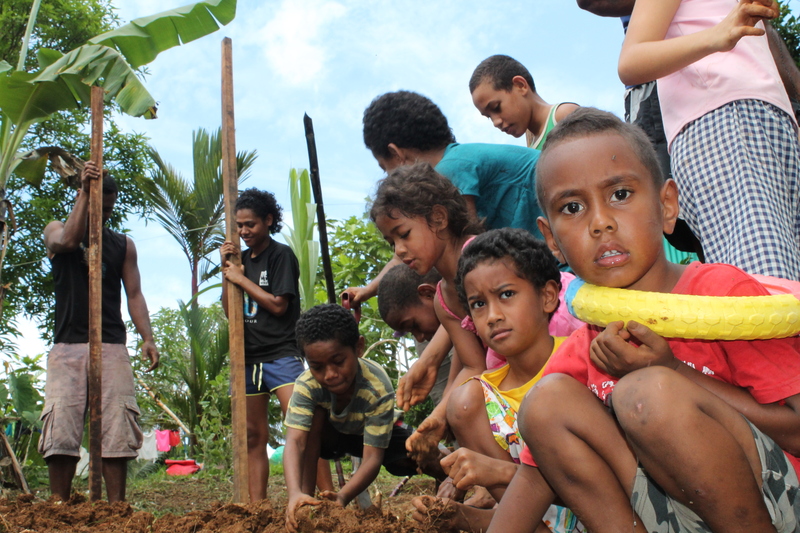 WWF South Pacific Sustainable Land Use and Livelihoods Office Unaisi Malani spent the day sharing the wonders of gardening and organisms living in the soil with the children of the settlement.